In hot pursuit of the villains that kidnapped their friends, the remaining members of the Mighty Nein raced to find the caravan before the slavers reached the safety of Shadycreek Run. Upon catching up with still a couple days to spare, the party set to work hatching a plan to defeat a dark part of Keg’s past and right the wrong that had been so recently visited upon them. Set up an ambush point down the road, a little more than an hour away from the Shepherds’ campsite in hopes that the lull of travel would catch them off guard. Knock a tree trunk over on the first cart, stopping the carts and crushing one of the slavers. Caleb casts Slow on as many humanoids as he can target. Nott rushes past the illusion of one of the carts and unlocks the cages, freeing prisoners who will hopefully turn into allies. Everyone else rushes the Iron Shepherds, focusing all attacks on one member at a time, starting with the magic users. The party recognized their lack of ranged damage options outside of Nott and Caleb, but opted to have their bruisers focus attacks while Nott attempted to release the prisoners and potential allies. Even though the Iron Shepherds had more numbers, the Nein were counting on the element of surprise. Speaking strictly in terms of positioning, the spread of the battlefield was very much not in the Nein’s favor. Caleb was much closer to the action than he liked due to the lack of hiding spaces. Nott removed herself as an offensive asset to place herself right in the middle of the battle, her application of oil to Lorenzo the sole exception to this. Her repeated attempts to pick the locked cages were met with disappointment, enhanced even more by watching half of these ones die at Lorenzo’s hand and not finding her friends among the prisoners at all. Beau and Molly entered the center of the fray, clumping together to give each other advantage on Dwelma. While this would usually be a good strategy against a magic user, this backfired as soon as Lorenzo revealed himself to also be a potent caster. Caleb’s Slow definitely had the right idea and targeted all the right people, but only the bard, barbarian, and weaker thugs were affected, leaving Lorenzo, the druid, and the rogue free to react. Dwelma had little trouble removing this effect after saving through two of Beau’s attempts to stun her. Beau’s Sentinel feat did serve her and Molly well to prevent Dwelma from fleeing to safety while they continued to whale on her. Keg found herself too far from the action to be of any use to the original plan. Her initial shock at seeing her old crew rendered her attacks against Prodo, the rogue and only Shepherd in range, completely ineffective. She found herself equally helpless in the second round as the direction of the battle became more apparent. It was only in her sacrifice in the third round that she was able to turn a complete disaster into a partial one. Unfortunately for both Keg and the Nein, Keg’s information was despairingly incomplete, a combination of her lack of understanding of magical implementation and the Shepherds’ individual choices to not show off everything they could do until the time was right. 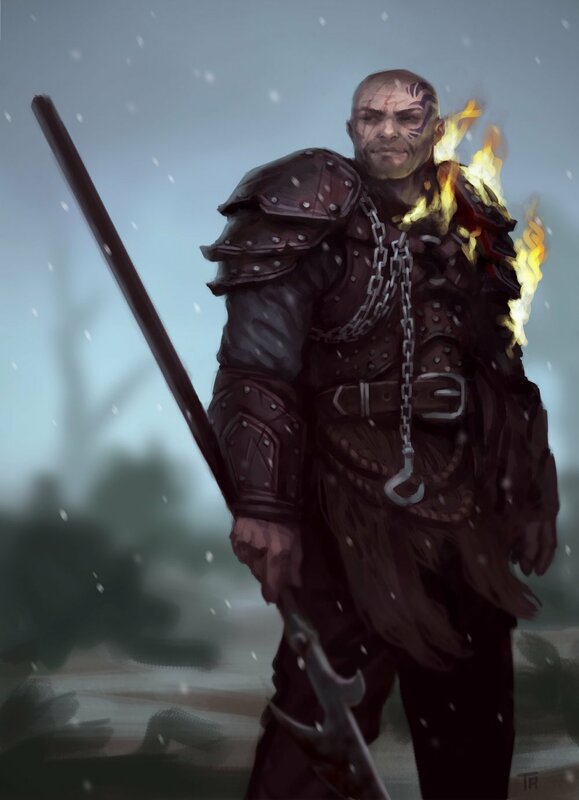 The Iron Shepherds earned their reputation in “The Run” through cruel and overwhelming efficiency. Faced all together, this was not a winnable fight. Keg warned that Dwelma would be the greatest threat after Lorenzo if he went down before she did. As such, she became the Nein's primary Target at the start of the fight. Although she was taken out in the second round, she managed to dispel Caleb’s Slow spell. Despite Keg's provided information that Ruzza's magic is innate, the half-elf's charismatic magic appears to reflect that of a bardic persuasion. Although she desired to inspire her boss, the Slow spell limited her to an (ineffective) casting of Hypnotic Pattern. After the fight, she also cast Cure Wounds on Lorenzo. Prodo’s dexterity served him well this encounter. As the driver of the front cart, he dodged the crashing tree trunk, ensuring that it only served to stop the procession. At the beginning of the fight, he was the only member in range of Keg, and successfully sidestepped the javelins she threw in a panicked state. His sneak attack and follow up shot gravely injured Molly, though his singular bolt against Keg in the following round merely bounced off her armor. Juam’s limitation due to the Slow spell ensured that she did not deal any damage, preventing another potential death. The only attack she took missed Molly, and she was unable to travel fast enough to both reach and attack Caleb. Although she ended the fight right next to the wizard, she angrily stepped back to deal with the crushed cart as Lorenzo put his own finishing touches on the encounter. The unnamed crossbow wielders contributed little to the encounter beyond padding the Iron Shepherd’s roster. Caleb reflected the only true shot either of them fired. Despite this, numbers are numbers. The leader of the Iron Shepherds was particularly wise to keep his abilities a secret until he was ready to use them. The simple human with a glaive gave a mere taste of the reason why he’s in charge of this operation. Lorenzo was always willing to make sacrifices. He wasn’t particularly teary-eyed about Dwelma’s passing, he killed half of “his merchandise” on the back cart with Cone of Cold without a second thought for either their lives or his profits, and he arrogantly accepted several rounds of unnecessary fire damage to drive home his intimidation. While Matt stated that Lorenzo’s confidence may or may not have been a front, one thing is for certain: his pride in besting Keg is the only thing that kept the casualties as low as they were. Despite having the element of surprise, a thoroughly discussed plan, and the choice of battlefield, the Mighty Nein found themselves in a disturbingly similar position to that of the much lesser bandits they had fended off twice already: hopelessly underpowered and outnumbered against a much stronger foe. While the Nein’s assault was arguably more more altruistic than the clueless bandits, the Nein also found themselves down a member after the dust settled. Molly took a total of 19 damage from his own abilities this fight, a solid third of his total 59 HP. This extreme misfortune in self-damage rolls, coupled with serving as the party tank without a healer, placed him in a most unfortunate situation in the face of hardened killers of much greater arcane and physical capability. Both of his attempted blinding Blood Maledicts failed to restrict the intended shots from making contact, and both attacks proved critical (a sneak attack, and a lethal blow). Molly’s primary goal in the plan was to distract while everyone else accomplished what they needed to. His vibrant appearance, his dramatic flair, and his supernatural invocations ensured that he would take the brunt of attacks, rather than Beau or anyone else. By the time Lorenzo was ready to make an example for Keg, Molly had sacrificed enough of himself to appear easy prey. The attempt to blind Lorenzo was a big risk… And it did not pay off. But it did distract Lorenzo long enough to let Keg allow Beau to get away, to Beau’s rebellious disgust. Unlike the bandits, it wasn’t altruism that left the rest of the Nein (and especially Keg) alive when the caravan continued on its way. Thanks to Keg’s high roll in her plea in desperation and Lorenzo’s pride in crushing her spirit, she escaped with both her and the remaining three members’ lives.